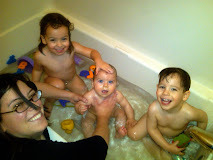 My blog has been all about the kids the last few months and so little about Big Law and Working Mom issues. Yesterday our nanny had to see her doctor unexpectedly for a follow up on a medical problem - at 1:30 pm in the afternoon. Husband is traveling. So in the midst of a meeting I had to figure out who was going to be with the kid so she could go. I'm texting my mom and my friend Helen on my blackberry to figure out who can come. Helen is a teacher and not back in school yet so she came over. Then I got stuck at work and I had to make sure my mom could come over for bedtime. Our nanny can do bedtime but I don't really want to pay time and a half for her to be there while they are sleeping. It occurred to me - why am I the one who always does this? Husband wasn't at all involved in the process. He never has to figure out how to deal with bedtime issues when he's traveling or other appointments and emergencies that come up during such travel time. The disconnect is that Husband can get home when he's not traveling but I can't get home when he is traveling. Even if our nanny puts the kids to bed he's never home later than 7 pm. My schedules is 100% unpredictable. Often I get on calls and clients need documents in the late afternoon. But I never know until late afternoon. Occasionally I can tell Husband - I'm flat out all week and won't be home. I'm tired of organizing and juggling and "figuring out" how to make this work and I feel like I'm doing it as a single parent while working more than full time. My career has taken a back seat to Penny's medical issues and appointments (as it should of course) and yet Husband thinks he's been doing so much that his career is suffering. We could pay someone do nighttime care when he's traveling but then every day I have to figure out by a time certain whether we need that person - and there are some days I really honestly don't know if I can leave until 5 pm or later. And then there is the $$. Husband asked me last night - how do others do this? I told him that either one spouse stays home or the other has very, very regular hours. Our jobs don't fit that model - so we are at an impasse. Ugh, it's so stressful, isn't it? I wish I could tell you that when hours are extremely regular (doesn't get more regular than being a teacher!) it's easier, but it's not. For some reason, dads just do not organize babysitters. I have yet to figure this out. It's just not something that comes to mind- we both have a meeting, my first thought is "What about babysitting?" and I have no idea what Russ's is, but it's definitely not babysitting! Glad to hear that Penny is doing ok these days... hope you're getting excited for the birthday! Well, I say this kindly but welcome to a dual parent working household. We did it too. And yes, I did the scheduling as do you. I have worked for large firms and they always have attorneys that don't work full-time...not a possibility for you? It is harder since you have a husband who travels. There will have to be a compromise at some point....look at pros and cons of which parent should try if at all possible to cut the hours or look for another job that will allow part-time hours. Which I know, in this economy, good luck. When my boys were your kids age, as Monica above says, we use to try and sit down together on Sunday and look at the upcoming week and plan that way. Good luck, it is hard. "Husband asked me last night - how do others do this? I told him that either one spouse stays home or the other has very, very regular hours. Our jobs don't fit that model - so we are at an impasse." Another option is some kind of live-in care. With that aside -- seems to me that when he is traveling, you should be in charge of planning the care. When he is not traveling, he should be totally in charge and you work as much as you need to. In other words, YOU DON'T WORRY ABOUT IT THEN. He can do it. Sometimes I just HAVE to go home. Period. A couple of things on this, sorry if this gets long! Jon and I both used to be traveling software consultants. That is how I met Jon - on assignment in Chicago. Seeing other families go through this, we knew there was no way we could do this for the long-term with both of us traveling if we were going to be away from extended family. So we made the joint decision that he would stay traveling and I would find a regular hour job that had flexibility as a working parent. These are hard to find in software so my choices were limited. Upsides: I now telecommute full time. My hours are 9-5 every day, RARELY need to work overtime (generally once a year during release). If I need to take a few hours to take a kid to a doctor appt, I can make up the hours any time during that week. I work for a family-friendly company. Downsides: I do not necessarily love my job (love the benefits though). I have sat back and watched Jon get promoted into roles I would have gotten if I stayed in consulting. He makes twice as much as I make (I make a lot, but still!). Since he's gone regularly every week, it's on me to do 100% of the stuff when he's gone. However this job affords us the opportunity to have the rest of our life exactly as we want. As for the traveling, that was the hardest piece for Jon and I to learn how to balance. At first his argument was that it's not like he is doing NOTHING when he is gone, he is working. But I argued that I had two jobs while he was gone - actual job and kids/household. Over the last three years, we've learned to work out the specifics of how we deal with things. When Jon's here, he takes on much more of the share of general kid stuff. He gets up with them, he takes them to school, he goes to their doctor appts, he schedules stuff with the house, he takes the cars for maintenance, he calls babysitters, etc. When he's gone, it's all on me. When I say that first year of twins kicked us so hard in the butts, it was because Jon was traveling and the kids were so sick all the time. We had at least 1-2 doctor appts a week for 6 months which meant I had to work almost every night AND deal with sick kids on my own. Plus the general first year of twins craziness. Everything fell in to place when Alex got his helmet off, he stopped PT, Nate got ear tubes, and Nate outgrew his reflux. This all coincided with the end of cold and flu season. It's still a struggle but it did take us some time to figure out a method that works for us and it does come at a price. The biggest price is my career is not at the point that it could be. I've personally made peace with that because I get to spend so much time with the kids, yet still have a forward moving career. Sorry for the novel. This is something we have struggled with since the boys were born and there were some tough choices in there, so I definitely feel your pain. Communication is really the way we handle it. I agree with ElizabethE ... on the nights Husband is supposed to be home in time but can't be, he should probably be the one to arrange the help (asking for your help with it only after exhausting his own resources). While he's traveling though, that wouldn't make sense. Good luck with it all ... don't let it drive you TOO crazy! I wish I had some helpful advice....mostly we are the impasse, too. Let us know if you find a solution that works! I have to agree with Laura on this one. I think you just have to figure out what works best for your family and a lot of times that involves one parent making sacrifices in their career. I also made the decision to have my career take a different path (initially part time at my law firm and then moving in-house) than I had originally planned. I just found it was way too difficult having two working parents with unpredictable hours. And in the end, can I say that I am completely happy with my job? Not really, but it affords me the time with the kids and the time to get all that other extra stuff taken care of that would be so stressful otherwise. I also try to think of my choices as not totally changing my career path, but maybe just postponing it a little while. I can always go back to firm life after the kids are a bit older. Will I do it? Probably not, but for some reason it makes me feel better telling myself that. This is hard, it is really hard. My husband and I are both physicians who work full time. Our girls are 14 months. I am on a research and clinical track because I enjoy both the taking care of patients as well as having an active role in creating solutions to healthcare problems. Like you, we have gone to school and worked really hard to get to this point (and we are still very early in our careers). However, we have jointly made the decision for me to cut back to working three days a week. I will be giving up a research path that I enjoy, but frankly I really don't care nearly as much as I thought I would. I just want to be with my girls more. Yes, we are taking a pay cut, but even though we are "only" in primary care, we can still lead a pretty comfortable life. Besides, in the end, a decision like this is so much more than a financial one. I don't think there is a solution to this complex problem (that admittedly seems to bother women more). The decision is one that you make with your partner, prioritizing your life and your children's needs. Good luck to you. I absolutely empathize with you, and I hope I am not overstepping a blog boundary when I say that from the tone of your posting, something is going to have to give in order for you to find some peace both at home and at work. This juggle is one of my least favorite parts of parenting. Even as a (mostly) SAHM, these issues come up around my own doctor's appointments--or recent surgery--and it's a scramble. We did several things when we had the kids--I no longer work full time and my husband took a step back at work. He used to travel M-Th and that was not feasible with kids. Plus, when I do work, I HAVE to be there since I'm teaching---no me = no class. So there are some nights when he just has to move stuff around at work to be home by 6pm. We both took a step back career wise, and even though mine was bigger, I'm sure his work suffers because he comes home early and doesn't travel regularly. How could it not? I asked my BIL the same question the other day (he's a partner at a Big Law firm in NYC)---how do parents there do it when both parents work? He said people either have live-in help or two nannies, one for daytime and one for night. It's apparently quite common there. His wife stays at home and doesn't work at all , which is how they manage his travel and work hours. Not sure if that helps, but it might be worth it to ask around at work and see how others figure it out. I'm a single mother by choice. When I decided to get pregnant on my own, I made sure I was a shining star at work. I'm a software consultant who used to travel a ton, but everyone knew and understood that once I had my girls, there would be no more travelling. Because I've been at my firm for 9 years and I've proven myself, they've been very understanding. But, it also means that I've turned down assignments with unpredictable hours and commutes to be on a project that won't advance my career. I'm fine with that though, and knew it would be the case going in. My nanny can stay late and has on occasion, but missing feeding my kids dinner is a sacrifice I'm not willing to make on a regular basis. I'm a lawyer at a big firm, like yourself. As far as I can tell, the young moms (associates) I know in corporate don't juggle - they can't - it's just not how corporate law works - their family always takes a back seat when client demands require it and their children are largely raised by the other parent and/or nannies (usually more than one or one who lives in or works a lot of OT) (btw, that's not meant to be a value judgment, just a statement of fact). This doesn't mean their children aren't important to them -of course they are and I've seen plenty of partners take a child's phone call while in a meeting, leave a meeting early for a recital, etc. But for associates, it's harder to have the gumption and job security to do that. Other departments have a better chance at part-time, flex-time, etc., but it's also hard to make a switch like that. So I really think for you, you either have to accept that this is what your kids' early years will be like and get a part-time nanny for evenings because this extra stress of what to do now on those rough days just isn't worth it or think hard about making a change of some kind. The good news is that if you choose to stick it out, I do think partners have an easier time with the juggle - partly because their kids are older and partly because they're in charge and delegate to the associates below them. They still work hard, they still deal with unpredictability, but they also have a bit more freedom and flexibility - and remember, all your kids know is what their lives actually are - they don't judge or compare you - we do that to ourselves and it's really easy to feel guilty about having a career that's important to you (I see women do this but never men) but try not to - it is ok to think your career is important and to make sacrifices. I empathize with your situation and wish you the best of luck in figuring out what's going to work for you. Good times. Both of us work, and my wife's job has her travel time with some frequency. I don't have a great answer for you, other than to say I feel your pain. Your martyrdom goes beyond ours, though, because of the two kids issue, plus the fact that Penny is sick. Life gets a lot easier when your kids are not sick and when they start school. You both are going to feel like you are pressured in terms of your jobs. That has led to many "discussions" in our household, because we each feel pressured. Can you do more work from home, via citrix or whatever? Friends of ours are two working lawyers with twins just starting kindergarden and a daughter a year younger. They've had a live-in the whole time and it makes a huge difference. Wish I had something helpful to add, only that even with one FT working parent and one PT working parent, it's not easy either. But, they won't be this little forever, so I am banking on it getting easier when they are older. It is hard and travel is the worst. My husband was in private practice, but is now a judge, so his hours are kinda regular, but they're also very inflexible. It's now easier for him to pick the kids up most days, but I can't imagine he can reschedule his whole trial and hearing docket when one of our kids has a sick day. Let's talk turkey: how are your hours? For me, it's not about flexibility so much as billables. I can be firm and tell clients and partners I can't do X because I have a commitment (I'm not in corporate, so I think it's easier for me), but I have a really hard time billing my hours and spending more than 2 waking hours w/ my kids on weekdays. I make it livable for myself because I really really try to safeguard my weekends & not work on weekends. It makes me very grouchy if I have to. I'd rather be much busier during the week and not interrupt our family time on Saturday and Sunday. Generally, I think the answer is, someone has to have the job that "gives," but in our marriage, we're kinda towing the line 50/50. So both careers suffer equally! I'm the primary worker now, but I hope my husband will be 5 years from now. So we can't let him slide too much right now. Nannies and live-ins certainly help. We do 2 kids in daycare and getting them there in the morning and picked up in time is a serious operation. One idea, I know hospital daycares have long hours and someone have drop in and sick-child care. Might be nice to have that option for emergencies. Good luck. When your dr's appointments lessen, it should get easier.